Marble terrace overlooking the sea! Cozy: living room and kitchen! 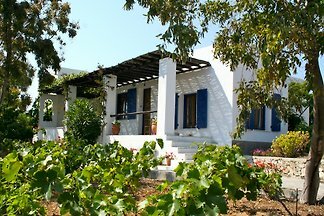 5 minutes from the sea, this beautiful apartment is located on the Greek Aegean island of Naxos. On the wind- and sun-protected terrace you can relax comfortably in garden chairs with fantastic views of the sea. Within a few minutes walk you can reach the small seaside resort of Agia Anna with its traditional taverns, minimarkets, car, scooter and bike rental companies and the bus stop that runs all over the island. The apartment is fully equipped and suitable for two to five people. The living space is inside approx. 80 sqm, the terrace covers about 50 sqm with pergola. There is a large bedroom with king size bed (160 x 200), two small guest rooms with single beds (each 90 x 200), plus another folding guest bed with slatted frame and mattress (80 x 200). The bathroom is equipped with sink, toilet and shower.The apartment is fully equipped with bed linen, towels, dishes, pots, pans, cutlery for 5 persons, kettle, coffee maker, toaster, refrigerator, washing machine and beach equipment. Cleaning is organized. 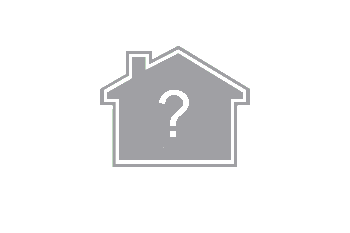 The type of accommodation is self-catering. The apartment is suitable for individual tourists. Sports activities nearby: swimming, mountaineering, cycling, mountain biking, horseback riding, sailing, surfing, hiking, water skiing. The cost varies seasonally between 50 and 150 euros per night. The apartment is located in a quiet and sheltered location on a cultivated hill called Kapares, above the fishing and seaside resort of Agia Anna on the west coast of Naxos. It takes about 5 minutes to the small fishing port and the beach of Agia Anna and about 10 minutes to Plaka, the longest and most beautiful sandy beach on the island. In Agia Anna you will find restaurants, traditional taverns, bars, cafes, mini markets, car, scooter and bike rental, a taxi rank and the bus stop that runs all over the island. Naxos is not only the largest island in the Cyclades, it also has the highest peak, the Zas (Zeus), 1000 meters high. You will also find the largest olive groves of the archipelago and the miles of pristine beaches that line the entire island. The tourist centers have a good infrastructure with many leisure facilities and water sports; a few meters further on, you will be surrounded by soft dunes alone with the sun and the sea. From ancient times marble is extracted in Naxos. Not only the famous gate, the entrance to a temple never built, but also the archaeological museum and the colossal prehistoric statues are interesting places to visit. On a trip through the interior of the island, you will discover impressive mountain ranges and steep limestone cliffs. In the kafénions of mountain villages you can let the beauty of the environment work on itself. In Chora, the capital of the island, life pulsates. The winding old town below the Venetian Kastro, with its stairs and alleys, invites you to stroll and shop. From the cafes on the boulevard you have uninterrupted views of the island's marina. In Chora and in the coastal town of Prokopios there are Internet cafes, in Chora and in Agia Anna there are post offices. Card phones can be found everywhere, even along the beaches. The average temperature is 12 to 15 degrees in the period between mid-December and early March, then increases to an average of 20 to 25 degrees, in summer it is warmer, but due to the insularity it is never hot, since There is always a cool breeze. I've been to Naxos since 2005 and know the island very well. 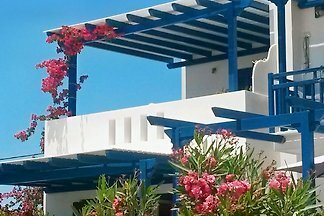 I offer here my beautiful apartment above Agia Anna on the west coast of the island, the so-called Riviera of Naxos - a blissful place!